Cast wine charms are cast in pewter using raised and recessed metal to create the design. Colors may be added to recessed metal areas. Extras: Color fills 0.40 each. Polished and sandblasted finish $1.00ea. You've decided that you want a custom cast wine charm - great. Now what? Well designing a custom wine charm is fun, so take a deep breath, relax and follow the steps below. Of course, if you would like help - we're here to help. 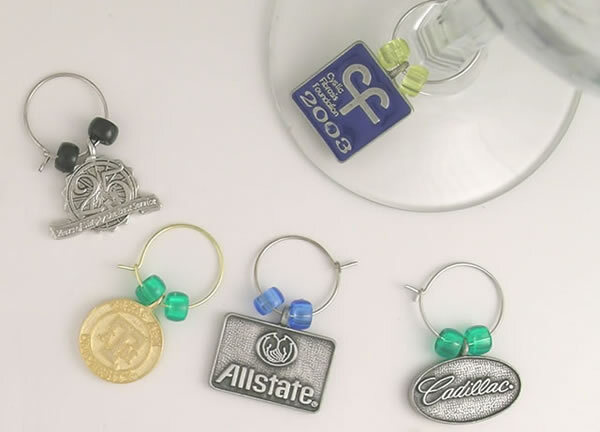 Size - most wine charms should be 1" or less. While there may be a few exceptions to that rule, a charm larger than 1" will seem clunky on the stem of a wine glass. So if you're sketching out a design, do so at actual size. Shape - One great feature of a cast charm is it can be nearly any shape you desire. Custom shapes do not increase the cost. In addition to the ouline of the charm - you may also design your charm to be 3D - using different levels of metal to create the desired look. Finish - When choosing a finish there are a couple of considerations. FIrst - if your design is done in 3D we'll almost always recommend an antique finish. Antique finishes leave recessed metal areas slightly darker than raised metal. Bright (e.g. gold or silver) finishes don't show 3D details well - as both the raised and recessed areas are shiny. A hand satin finish is often used in conjunction with an antique finish where there are flat areas on your design. The satin finish provides a brushed look to flat areas.